Nancy Morris believes that all teachers are creators and deserve an environment that allows their ideas to flourish — a belief that she hopes to instill within her students in the School of Education at Gannon University. “I really think it’s important that we think of teachers as creators and innovators, but they don’t always have time to do this and I’m very fortunate I’m in the position I’m in and have these resources and availability,” said Morris. Morris has been a special education and earlier childhood instructor at Gannon for the past seven years. The past three years, however, she has also started a business to help kids better develop their fine motor skills using special crayons. “The purpose is to make coloring accessible,” Morris said. This question kick-started the whole project, as her husband, Jason Morris, was working with the senior design project for engineers at Gannon at the time and brought the question up to the engineering department. There, it was Davide Piovesan, Ph.D., an associate professor and program director of the biomedical engineering department, who assisted in the conversation, and together Morris and Piovesan brought in occupational therapists to give their input on the shape of crayon. In previous experiences, Morris had noticed a lot of times where kids with special needs had difficulties gripping regular crayons, further delaying the development of their fine motor skills. “Inclusion is a reality in public schools and when you’re young, coloring is a major life activity,” Morris said. She said that Crayola also has a similar triangular shaped crayon, but it is the middle grip on her crayon that makes the shape most accessible. With the engineering department, they were able to make a silicone mold that allowed them to melt crayons into the mold, repurposing them. By 2017, schools around Erie County had donated over 300 pounds of crayons for them to repurpose into these special crayons. Using a hot plate in the basement of Palumbo, the first crayons were made. The launch of Effortless Art Crayons took place in the fall of 2017, as they gave about 250 students at the Barber Institute each a pack of their own crayons. Since then, Morris said she and her husband have done research studies with the crayons and found that when students colored with the Effortless Art Crayon, the task average increased 20 to 60 percent. The crayons are now sold online through their website and two online resellers, including Amazon. They are also sold at a number of local businesses, including but not limited to Pressed, Glass Growers Gallery and the Barber Institute Gift Center. The Morrises recently released a second version of the crayon, for those a little further along, with a narrower grip, in a variety of packaging and colors. Morris will also be one of the select women receiving the “Women Making History” award in March, given by the Mercy Center for Women and nominated by Gannon. She said it all started with a crayon. Morris said each day she puts in her all, working 9 a.m. to 5 p.m. at Gannon, then goes home and has family time, followed by business matters once her son goes to bed. 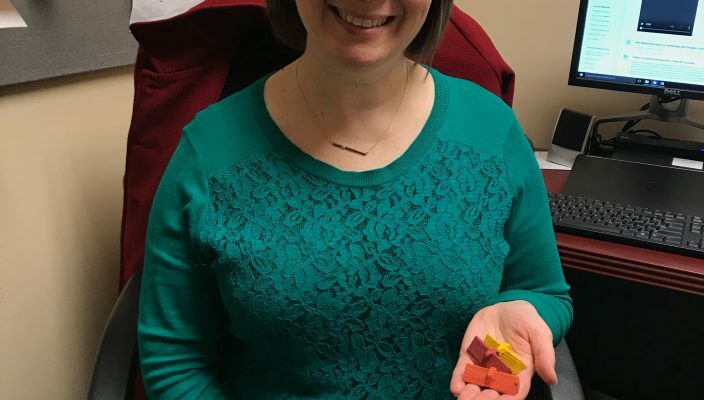 Morris and her husband are continuing to grow their company, furthering research studies, gathering testimonials and bettering their crayons along the way.